Today’s organizations and their audiences are increasingly leveraging the excitement and engagement of live video in multiple ways. Yet, as organizations seek to adopt live video for time-critical use cases, streaming latency of up to a minute or more has emerged as a significant challenge. Current video streaming technology is not able to provide the realtime latency required to provide the viewer experience necessary to realize live streaming’s potential impact on the industry. What is needed is new technology that can be deployed on a global scale to deliver sub-second latency online video to audiences on any device they are using. Limelight Realtime Streaming provides sub-second live streaming latency for use cases demanding the lowest possible latency, and is supported on popular browsers and devices. Online streaming of major sports events is rapidly growing in popularity, with the 2018 Super Bowl drawing a peak of 3.1 million live streams, the third consecutive year of streaming growth, as the number of TV broadcast viewers slipped 7% from the previous year11. The 2018 World Cup also broke live streaming records across platforms2. According to the Limelight “State of Online Video 2018” report, 65% more viewers would stream more sports events if it was not delayed from the broadcast. Besides sports events, other online live video use cases are poised to experience significant popularity if the streaming latency issue could be addressed, including online gambling, esports, and video gaming. The delays inherent in a traditional broadcast signal path are consistent and can be easily controlled. However, latency issues are inherent in the majority of streaming video formats for the internet. Traditional HTTP streaming breaks the video in small segments or chunks that can be buffered prior to playback, leading to typical streaming delays of 30 seconds or more. While it’s possible to reduce the size of the chunks to minimize the delay, making them too small increases the chance viewers will experience video rebuffering and other playback issues. When fans are watching a live online stream of a sporting event on their smartphone, the last thing they want is to get a chat message from a friend watching the same event on TV saying, “What a great play!! !” before they’ve seen it on their mobile device. For sports broadcasters, delivering low-latency online streams increases viewer engagement and grows total viewership. For online casinos, the ability to stream in realtime means all players instantly get to see the turn of the cards at the same time, allowing them to place their bets more quickly and increasing the number of hands that can be played each hour. In addition, when live in-event online sports betting provides realtime streaming, players can place bets up until the last possible second, increasing the number of wagers. Sub-second latency allows online play and commentary along with live in-arena audience. Adding live chat, polling and surveys makes the viewer experience more exciting and increases the total audience. Limelight Realtime Streaming, a WebRTC-based realtime streaming solution, is the first globally scalable solution that delivers live broadcast-quality video from anywhere in the world, to anywhere in the world, with less than one second of latency. 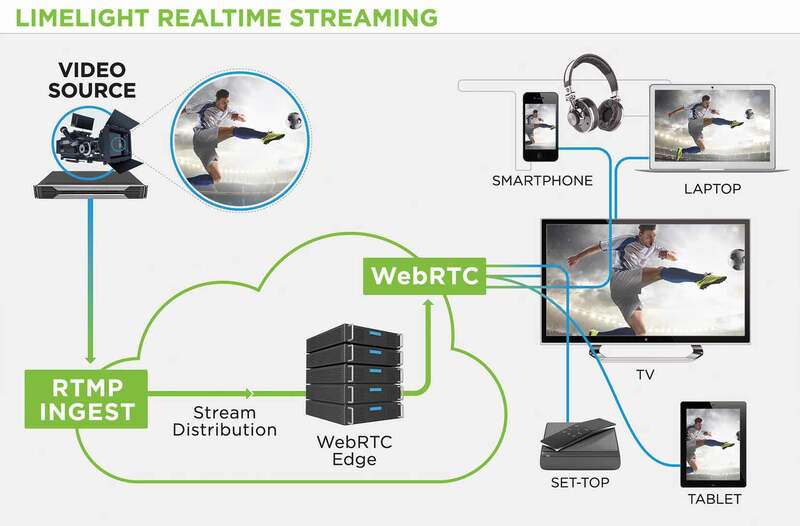 Limelight is at the forefront of implementing WebRTC technology for global realtime streaming. Released in May of 2011, WebRTC (Web Real Time Communication) is an open standard for embedding secure, SSL-protected real-time voice, video and data communication capabilities into a broad range of web browsers and mobile applications. While WebRTC was originally designed for peer-to-peer communication, Limelight has extended the technology and adapted it for global realtime streaming to massive audiences. HTTP chunk streaming for HLS/DASH utilizes the TCP/IP protocol. The high latency is due to the buffering of chunks prior to transmission. Limelight Realtime Streaming uses WebRTC technology to stream live video with less than one second of latency through the fast and efficient UDP data transfer protocol. Video streams do not need to be segmented into chunks and buffered before delivery. Adaptive Bitrate streaming delivers the highest possible picture quality to each viewer, even over changing network conditions, ensuring the best possible online experience. Limelight Realtime Streaming leverages Limelight’s global private network which has the capacity, reach, and connectivity to ensure a high-quality, realtime viewing experience for viewers wherever they are. Another advantage of Limelight Realtime Streaming is that while some other low latency streaming solutions require custom software development or rely on special client-side plug-ins, Limelight enables playback and delivery on standard web browsers. Native browser support means video playback can happen without the need for plug-ins or special players. Currently supported PC and mobile device browsers include Chrome, Safari, Firefox, and Opera (Microsoft Edge coming soon). What happens if my firewall blocks UDP? Some enterprise firewalls are configured to block UDP traffic. In many cases, this will not be an issue because live online streaming videos are often consumed by residential users rather than enterprises. But in instances where your enterprise does need to watch live videos and your firewalls block UDP, you can take advantage of Limelight Realtime Streaming’s capability to deliver video via TCP transport when corporate internet firewalls block UDP traffic. Limelight Realtime Streaming also features the ability to share bidirectional data. This sharing of integrated data along with video allows you to develop your own creative ways to use data as part of your video workflows. Viewers watching live sporting events can receive statistics about their favorite players and even vote on their favorite plays, or choose which camera angle they would like to view. Gamers can have an integrated chat channel with their video, and online auctions can be streamed along with the ability for viewers to bid on items in realtime by hitting a button. These interactive capabilities open many new business opportunities. Limelight provides the scalability to ensure your viewers receive the best live experiences. Unlike most CDNs, Limelight’s high-capacity private fiber backbone bypasses the unreliable public internet when delivering content via peering agreements with ISPs around the world. With complete control over routing from the content source to the user’s ISP, the Limelight CDN eliminates many common bottlenecks in the content delivery process. ■ Realtime Video Delivery—Stream video to anywhere in the world in under 1 second. ■ Adaptive Bitrate (ABR) Streaming—Viewers automatically receive the highest possible picture quality for their available bandwidth and current network conditions. ■ Configurable Streaming Options to Support Different Devices—Define a custom bitrate and resolution for video streams to meet your specific needs. ■ Video Can Be Viewed Using Standard Web Browsers— Live streams can be viewed in standard web browsers including Chrome, Firefox, Safari, and Opera (Microsoft Edge coming soon)—without the need for special plug-ins. ■ Scalable Global Delivery—Limelight’s global private network bypasses internet congestion with direct connections to more than 1,000 ISPs and end-user networks and Points-of-Presence (PoPs) in every region of the world. ■ Highly-Resilient Video Playback—Audio-priority streaming allows audio to continue to play if bandwidth drops and video freezes. RTMP and HLS video fallback available to support older legacy devices. ■ Redundant Ingest Capability—Multipoint ingest of your video stream provides seamless failover to a backup location for added resiliency. ■ Prevent Unauthorized Access to Your Video—Several methods are available to restrict access to video including geo-blocking based on viewer location, IP whitelist and black list control, URL tokenization, and SSL encryption. ■ On-Demand Streaming Capability—Streams can be easily configured, started, and stopped through programmatic APIs and a self-configuration portal for flexible scheduling. ■ CDN Stream Authentication—Restricts ingest of live streams to authenticated sources. ■ Integrated Analytics for Decision Making—Robust usage data is available to help you make strategic business decisions. ■ Develop Your Own Interactive Applications—Integrated data sharing allows you to create interactive applications that provide realtime video and data to viewers and lets them provide realtime feedback such as voting, chat, and more. Limelight Realtime Streaming addresses viewers’ primary complaint with live online streaming by helping broadcasters and other organizations deliver truly realtime streaming experiences to viewers using standard web browsers. In addition, integrated realtime interactive data capabilities make live viewing an interactive social experience that increases viewer engagement and offers new opportunities for broadcasters to monetize their live streams. Limelight is committed to helping organizations deliver the best online experiences to their viewers and maximize the value of their online content. To learn more about how Limelight’s low latency video delivery solutions can reduce latency for your online live video delivery application, contact us at: info@limelight.com.